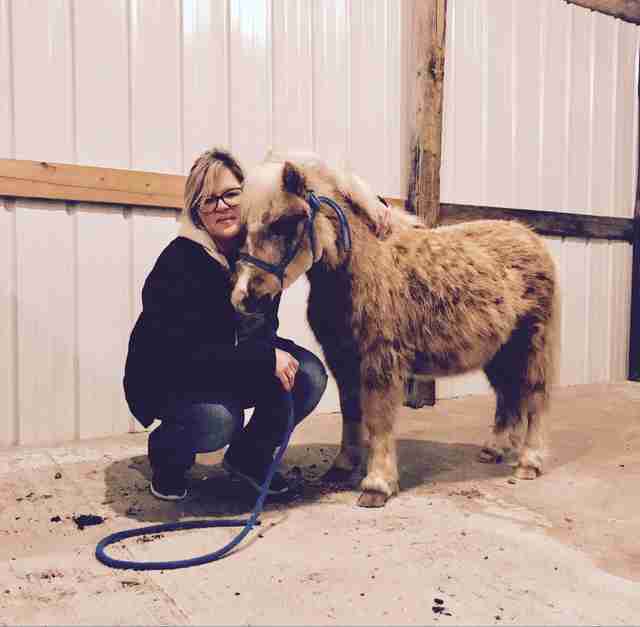 One night about two weeks ago, Callie Schenker arrived home to her farm in Missouri and saw something utterly unexpected: Her one-eyed miniature pony, Cricket, was being ridden by a neighbor's corgi. Schenker had the wherewithal to capture the scene on video. "I was astounded," Schenker told The Dodo. 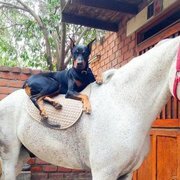 "I had no idea that, on the one hand, the dog could ride. And two, that Cricket was letting him do it." Naturally, the video went viral, racking up more than 6 million views. Some of those viewers were skeptical, telling Schenker they didn't believe the corgi just happened to be on top of Cricket like that. "People said I must have put the corgi up there. Tied him on there," Schenker said. 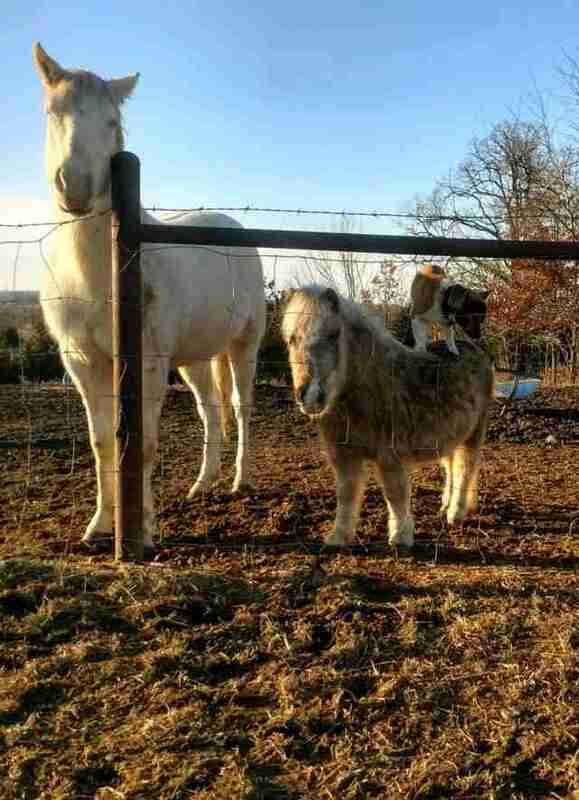 "People were like, ‘That's a corgi, he can't just get up on that pony.’ I'm like, ‘He just did.’"
Still, Schenker hadn't even known that Cricket and the corgi were hanging out, let alone that they're riding buddies. And she was left with a lot of questions herself about how exactly this pair was accomplishing their circus-like trick. On Tuesday, she got her answers. Schenker was inside the house "putting on makeup," she said, when she heard some noises outside. She looked out her window — and there was Cricket, being ridden by his corgi friend again. "The corgi is like a captain," Schenker said. She ran outside with her phone. By the time she got there, the corgi had dismounted. But Schenker stuck around. Not long later, the corgi began to bounce and bounce, with what seemed like Cricket's encouragement, until he was able to hop onto Cricket's back. "I kinda had a hunch that's how he did it. But it was cool to really see. And to see Cricket actually play around with him was cool," Schenker said. Cricket, who is about 5 years old and 3 feet tall, has been living with Schenker and her husband Bob for about a year. The couple found Cricket, then very underweight, for sale for just $80 at an auction. 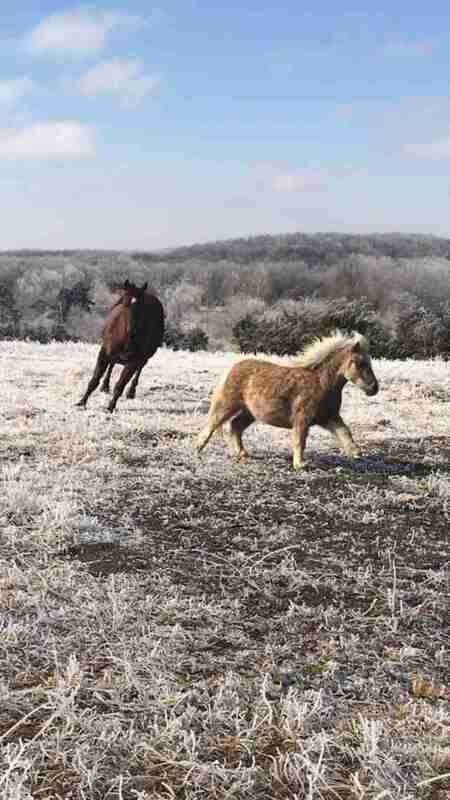 Schenker said Cricket was just a tiny pony who "didn't look like much." But she was instantly smitten. "I just fell in love with him," Schenker said. 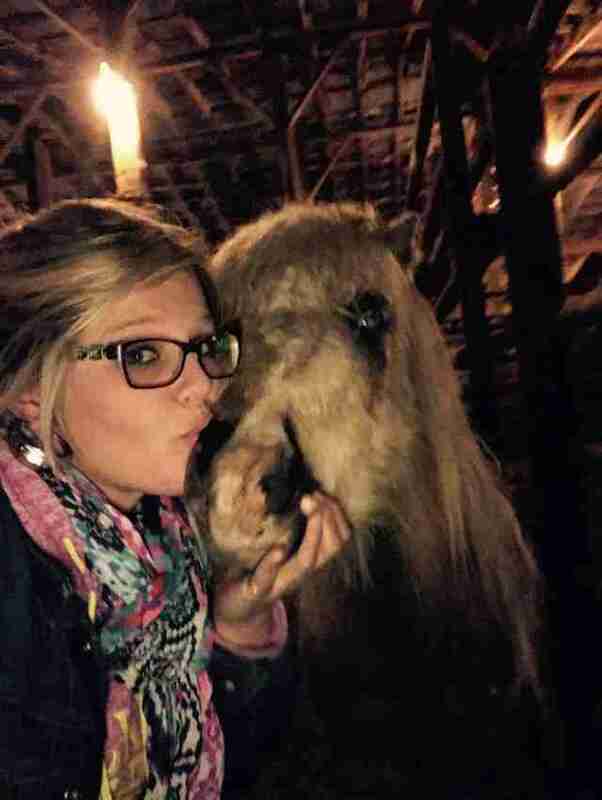 "I told my husband, I have to have this pony." Schenker is still just as smitten today. Even when he’s not carrying corgis, Cricket — despite losing his eye in an accident about seven months ago — is exactly as charming and delightful as you might imagine. Cricket follows Schenker around "like a dog," she says. He's put on a healthy amount of weight and likes belly rubs. 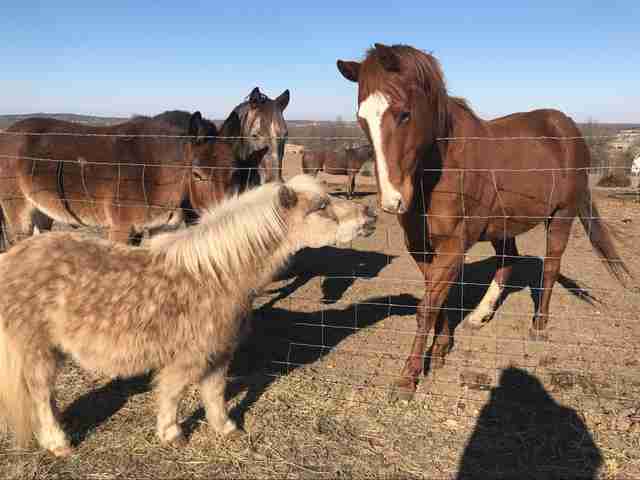 And Cricket is so gentle and sweet that he helps the family's more nervous horses learn to trust. "He ‘gentles’ them down," Schenker said. As for the corgi, Schenker believes his name is Roper, but she isn't sure. He lives with a family about a mile away, and seems to be a "free spirit," she said — showing up at her house sometimes to play with her two Chihuahuas, Taco and Red, in addition to his antics with Cricket. Even though Schenker now knows how the corgi gets up onto her pony's back, she’s still left with questions. Like, how often does the corgi bounce up onto Cricket's back? And what do they get up to once the corgi's in place? In the meantime, she likes to imagine these buddies having all sorts of adventures together in Cricket's 15-acre pasture. "No telling what they do when we're gone," Schenker said. Follow Cricket's adventures on Facebook.